So now that my segment on The Dr. Oz Show has officially aired, I can tell you all about the experience! And for those of you who missed it, it should show up eventually on the section of their website under Truth Tube. As of two minutes ago, it still wasn’t there when I checked. I don’t know how long it will be until it’s posted, but as soon as it is, I will post a link here on my blog to it. I tried taking a video of it on my TV but I didn’t have the volume turned up enough so although you can see it, you can’t hear it. I’ll try and get a better clip of it soon. So here’s how it all went down: One of the producers caught wind of this here blog and decided I’d be a perfect representative for insecure women everywhere! Not sure I should take that as a complement, but anyway, I talked with several producers and they offered me the opportunity to come on the show. After getting a boost of bravery from my best friends, I accepted the offer and just a few days later my husband and I were off to New York. Let me tell you, I loved New York so hard!! If I had a Sugar Daddy and a driver to haul me around, I would live in Manhattan forever. For some reason, I just really loved it. My husband had a good time, but after a couple of days he was ready to head home (he wasn’t quite as enamored as I was – he liked it, he’s just more at home in the country than in the Big City). New York City!! This was taken on the steps of the New York Public Library, aka The Mothership. This was one of my favorite places to visit. 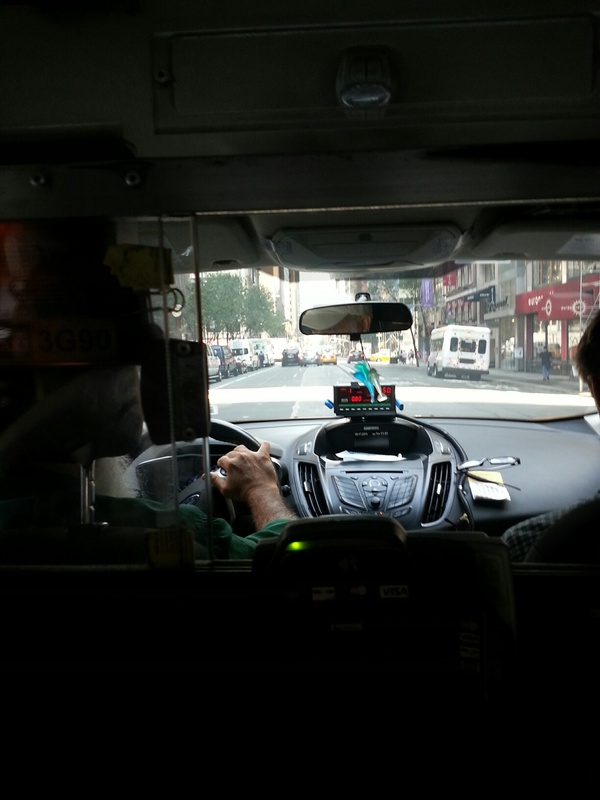 First (and only) New York City cab ride!! These guys don’t mess around. If you are in their way, oh well, too bad for you because they will run you over. Liberal use of the horn is the norm. 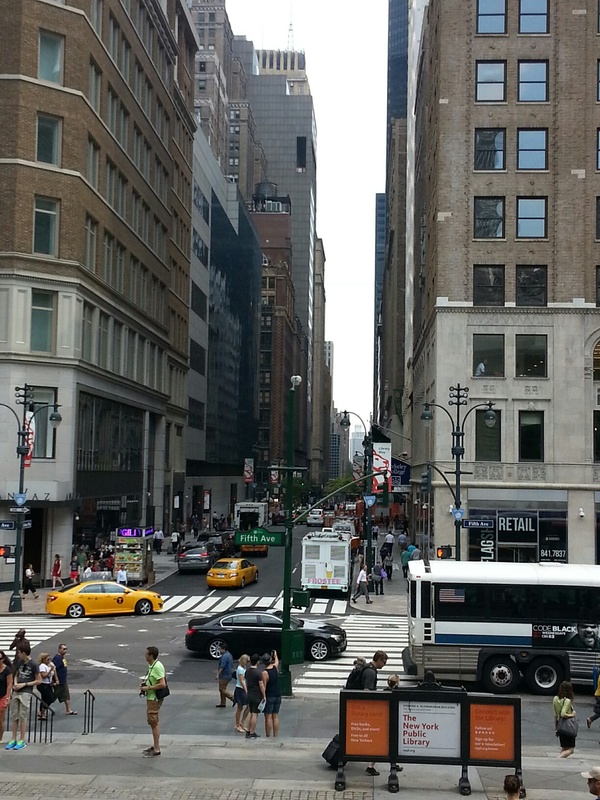 By the third day, we felt like New Yorkers. Here is my husband owning the cross walk like a boss. I have to give major props to the producers of the show – these are some women who are GETTING IT DONE. They are all so great and so good at what they do. I want to hang out with them some night over pitchers of margaritas and chips & dips and just hear what they have to say. I want them all to be in my circle of friends because did I mention AWESOME? Yeah. We filmed the background story first and although I was a nervous wreck, the Field Producer Anne and the cameraman Adam, were so nice and just a lot of fun to work with. They made me feel totally at ease and I did things for them I would NEVER have done for anyone else (step on a scale ON CAMERA, check myself out in a mirror ON CAMERA, walk around Central Park like I owned the place ON CAMERA). The next day we went to the studio where I spent a lot of time in the dressing room wondering WHAT THE HECK HAVE I GOTTEN MYSELF INTO??? There were lots of visits from wardrobe, from several different producers, a trip to hair & makeup (omg those hair & makeup women were the most calm, cool, collected women I’ve ever been around – they had a very soothing effect. I puffy heart them. AND they made me look pretty for the camera. WIN!) and lots of just waiting around feeling like I was going to throw up because I was so nervous. 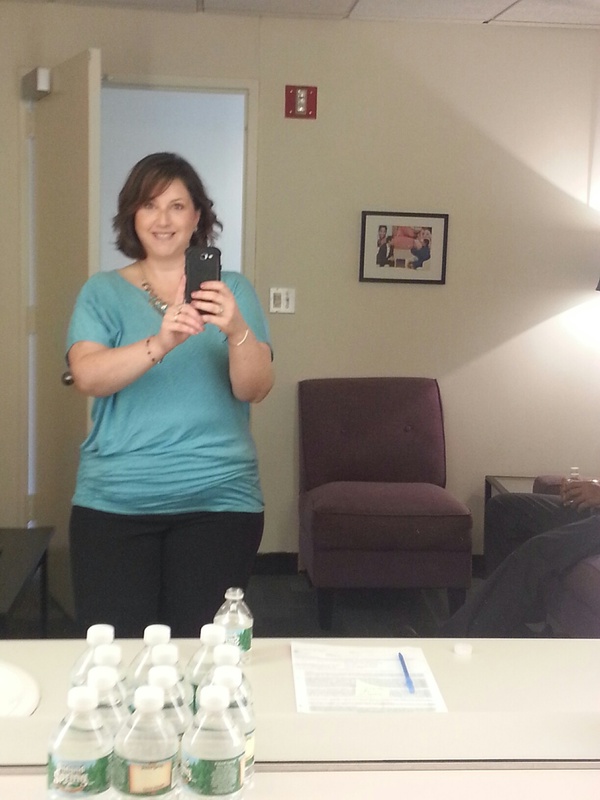 In the drssing room of the Dr. Oz Show! Then it was time to go film the segment! I met Dr. Oz right before my segment started and he was very, very nice and welcoming. He held both of my hands and looked me right in the eye and I honestly don’t remember what he said because by that time I was nervous blob of jelly. I was feeling nervous, spastic, excited, scared, and OHMYGOSHICAN’TBELIEVEI’MDOINGTHIS all at the same time. I remember sitting in the chair on stage and then it went by super-fast and was over! As I was leaving the stage Dr. Oz held my hands, kissed my cheek, and said some very nice parting words that almost made me cry. ← It’s today it’s today!! Super report!! I think you answered all my questions about how it went down. That was super that your husband got to come with you. And that WAS Central Park!! Thanks for sharing the back story! We only got to spend about 15 minutes in Central Park. I really wanted to go back later but there was just so much to do and so little time and in the end we just couldn’t make it work. I definitely want to go back and spend more time sight-seeing! Way to rock!! Action in spite of fear! I missed seeing you the afternoon it came on so I am looking forward to seeing it soon. I caught the show and thought you did so good – you were calm, composed, and didn’t seem nervous at all…plus you looked so pretty! What an awesome adventure, and how cool that you’re getting to continue it via the therapist. Thanks Shelley! It was a great adventure! Well, I puffy heart this! Wow how exciting! I have been to New York once a few years ago. Very busy city. I loved that you could buy anything you could ever want at any time of day or night but I missed my peace and quiet, definitely couldn’t live there! I clicked wondering if your blog was going to be swamped/over run from national exposure. Was relieved to find it very normal. That is a good thing, I think. New York is very fun I agree. I live in a very small town feel place. But I have been in New York, London, Paris, etc and really like being those places too. Glad you liked Dr Oz experience. When Diane was on, she commented on how tiny he is. Did that strike you too?